Inanimate Objects » What is Dull Cote? Dull Cote will become your best friend when you’ve finished a project. It’s a matte sealer produced by Testors. (The company that makes enamel paints for models.) A few sprays of Dull Cote and your figure will have a smooth, even finish. Dull Cote is great for bringing paints of the same color but different luster into line with each other. Dull Cote will even help cure spray paints that refuse to dry. 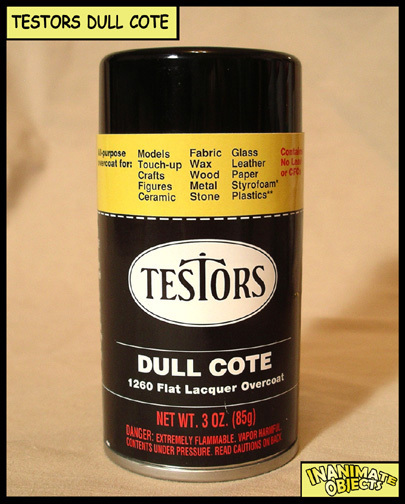 I’ve had good experience with Dull Cote on top of enamel sprays. Naturally, Dull Cote acts a protective sealant. Perhaps most important, though, Dull Cote does not act as a dust magnet, as so many other sealers do. I’ve had figures sprayed with Dull Cote on my shelves for years, and they collect no more dust than they should. Alternatively, I’ve had figures sealed in other brands that become giant dust bunnies in a month.